Documentaries come and go, and sometimes they are as easily forgettable as they are initially impactful, but we think Born to Be Wild, a film directed by David Lickley, deserves a little more attention. Nature documentaries have always been commercially and critically successful, and over the last few years the popularization of marching penguins, along with BBC-produced hi-def documentary series have certainly raised the bar for commercial success. High definition, 3-D and IMAX formats, along with the narrations of a man named Morgan Freeman are the new formula it seems. Documentaries are one thing, but when a popular film aims to educate young people about ecological conservation ethics in a new, fun way, we feel like we have to stand up and highlight it. Born to Be Wild is a movie aimed more directly at children than adults, though the big kids here in the office certainly enjoyed it. The short (45 minutes) film follows the stories of two sets of orphans, of the orangutan and elephant variety, as they are rescued on two different ends of the Indian Ocean by two dedicated women hoping to someday release them back into the wild. In what Morgan Freeman calls a “fairy tale” come to life, these orphans call to us in a familiar, Charles Dickens kind of way. As Dr. Birute Mary Galdikas rescues orangutans orphaned through the Borneo’s vast illegal logging problem, Dr. Dame Daphne M. Sheldrick does the same for elephants that lose their mothers to illegal poaching in Kenya. These women are a unique inspiration to the parent in each of us, and witnessing their adopted childrens' respective stories unfold, you will follow them from their loneliness in the wild, to their rescue, rehabilitation, and eventual reintroduction back into the wild. The forty five minutes of film truly is a fairy tale come to life; the story is certainly uplifting, though discouraging at the same time. The story of the animals’ orphaning at the hands of human acts would be altogether too depressing for children if the critters (and Freeman’s narration) weren’t so gosh-darned cute. Wildlife and travel documentaries are special to anyone with a traveler’s heart. They take destinations, vistas and wildlife, and deposit them all directly in front of an audience in a theater or living room. The team at Global Basecamps would like to think we do the opposite: bring the audience to the wild. Among our many featured destinations, travel to East Africa is becoming increasingly popular. 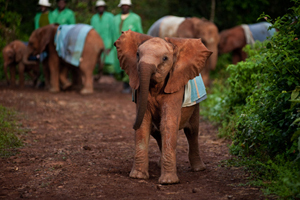 Ecotours can bring travelers face to face with these animals, and our Kenya safari tours can easily accommodate travel to the Sheldrick Elephant Orphanage featured in Born to Be Wild. 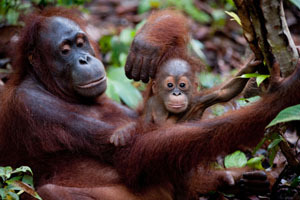 We have also sent clients to Camp Leakey in Indonesia, the wilderness research camp mentioned in the film, to interact directly with the easily lovable orangutans of the region. 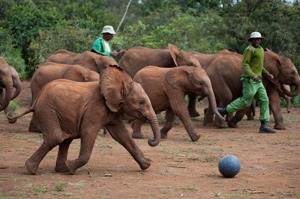 Watching one documentary out of many is one thing, but meeting these loveable orphans face-to-trunk can be a once in a lifetime experience.